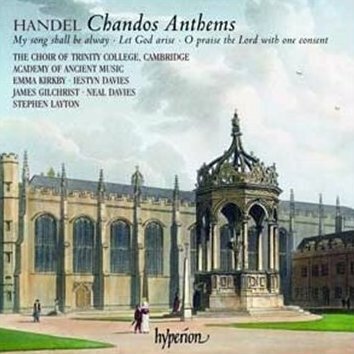 These three Anthems for Cannons or Chandos Anthems as they are more widely known, make for a glorious programme from the choir of Trinity Choir Cambridge and their musical director Stephen Layton and at over 20 minutes each they deliver generous recording of Handel's music which maintains high standards throughout. The works date from about 1717 and were written to be performed in the church of St Lawrence Whitchurch which the Brydges family used until their own chapel attached to the Cannons estate was completed in 1720. 'O praise the Lord with one consent', like the other anthems, uses psalm texts but dispenses with the expected opening orchestra sonata in favour of a longish orchestral introduction. The choir respond keenly to the text right from the start as Layton sets an elegant pace that allows for generous phrasing and an emphatic choral delivery. The following solo arias are in mournful minor keys and beautifully sung by countertenor Iestyn Davies and tenor James Gilchrist. In particular, Davies negotiates the low passages with an enviable vocal colour that allows him to use a large palette of emotions in a part of the voice that many other countertenors often find problematic. Gilchrist is, as always, a wonderfully energetic singer and makes light work of some of Handel’s fiendishly difficult fast passagework. The mood changes for Neal Davies' bass aria 'That God is great' (spot the reworking from the Queen Anne Birthday Ode) which is a jolly (major key) aria and very stylishly sung indeed. Later in the work Emma Kirkby's solo 'God's tender mercy' suits her thoughtful delivery perfectly. Kirkby's voice has softened somewhat over the years without losing any of its vibrant personality, allowing her to execute some beautifully subtle phrasing in the lower passages that really pull at the listener's heart-strings. The second anthem, 'Let God arise', gives us the opportunity to hear The Academy of Ancient Music on their own in the opening sonata. Their enviable violin-tone has always been one of my favourite aspects of their playing and I suspect this is in part due to Pavlo Beznosiuk, whose performances I always enjoy tremendously. Their oboist, Katharina Spreckelsen, also deserves a special mention for gorgeous phrasing and tone throughout. This anthem is sheer delight with the choir at the very best, especially as they enjoy the 'be scattered' figure in their opening chorus; they set very high standards for Cambridge choirs indeed even though I wasn't entirely convinced by the vowel-sounds in the opening figures of 'Praised be the Lord!' and 'Blessed be God'. Lastly, 'My song shall be alway' is a tapestry of familiar Handel moments borrowed from or by other works. More glorious instrumental playing (and astonishing breath control from the oboist) characterises the opening Sonata and is followed by a particularly beautiful aria for Kirkby and the chorus. Similar high standards from the soloists are heard all the way through this anthem and Trinity College Choir deliver a fitting end to the programme with their confident closing chorus, 'Thou art the glory'. This is the fourth disc that the choir have released with Stephen Layton and well worth buying for the sheer enjoyment that these performers communicate. Absolutely excellent.